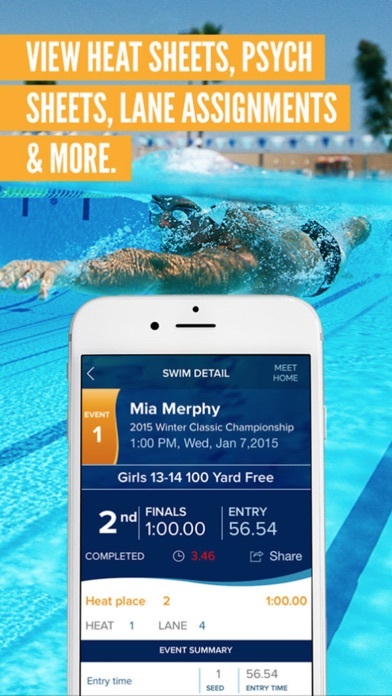 I love this app if you have a kid that swims it tells you about 1 minute later what place your kid got. My daughter loves to see what she does after she swims. I hope you like this app! I love it! 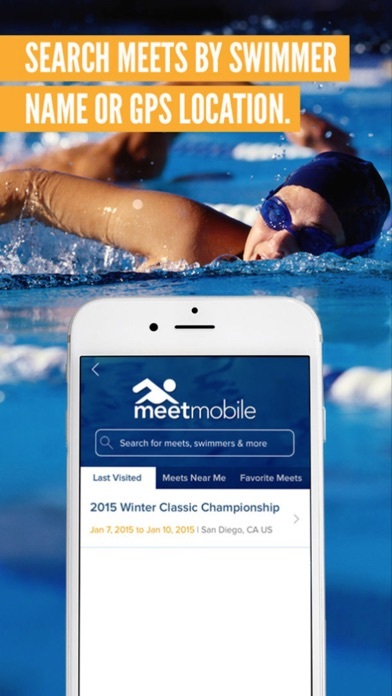 I noticed that it is saying the wrong heat places for the events we swam at a specific meet. Can you fix that? Other than that, the app is really good! All of the meets under Saginaw Heritage (SGHR) have the wrong heat places. I swam for heritage and they are all wrong. Same goes for all meets listed under Heritage High School (HHS). They tell you can unsubscribe at anytime and yet I can’t find any way to unsubscribe the app. It only gives you the ability to resubscribe. Don’t get the app. Main problem is VERY SLOW! I have no problem paying for this ap. 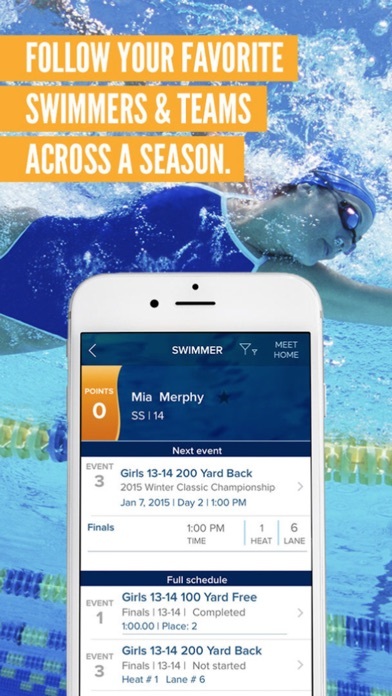 Just because it is the only App on the market for the swim community doesn’t mean the App can not be improved. It is way too slow. The response time from clicking on something is extremely long no matter what it is. Please fix this issue and your App will be outstanding! The app is so slow now. Takes forever to load anything once you tap a selection. The app has decent functionality, but beware that it can rip you off. I pressed the button to pay for the annual membership — $6.99. Authenticated with the Apple Store, etc. Nothing changed in the app. Still prompts me to pay (again) when I go back in. Basically a loss for the meet I am currently attending and probably have to spend a bunch of time going back and forth with the developer to help troubleshoot their buggy tech. Disappointed. Instructions bring you to manage your subscriptions, but leaves you with no option to cancel. I love this app most of the time. 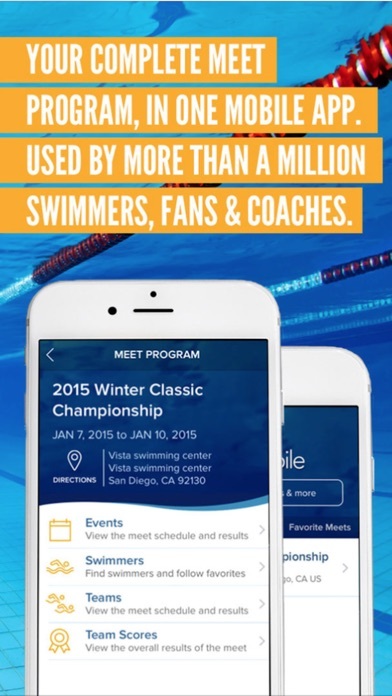 However lately it seems to be super glitchy and takes forever to load when I tap on an event or swimmer. Any of it. A lot of the time it won’t even let me tap on it. It seems it needs to be updated. It’s been like this since the last update actually. Not liking it whatsoever. The search could be a bit better too. Only reason I’m giving a 3 stars. Would be 4 if it wasn’t so messed up right now. Also, the RealTime results are only updated to the app when the locations WiFi is working correctly. There have been times when I don’t see results until the next day & at times it never updates for some events. 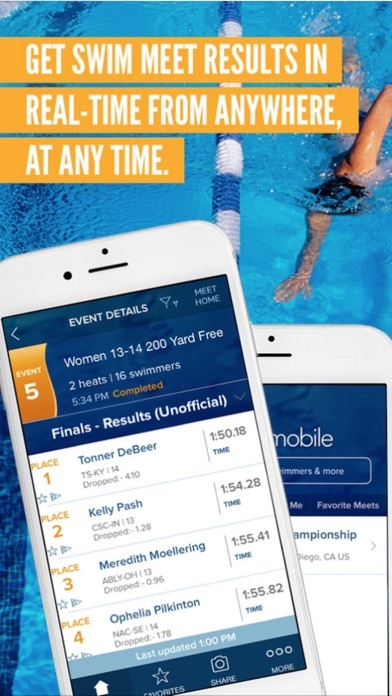 I wanted to stay updated on my sisters meet so I downloaded the app and when I realized my mom has a subscription I spent 30 minutes trying to figure out how I could login in to her account so I could actually view the results. Turns out the only way I could access my moms subscription would be to log out of my apple id and into hers which to me is absolutely ridiculous. Half of my phone is connected to my Apple ID so logging out would cause a multitude of problems for me and my mom. I really think this should be changed. This used to be the best app on my phone. Then they started charging us for it and changed everything. Nearly impossible to find the meet you’re looking for. Can’t even search for a city effectively. Get to work people and fix these problems!! !